The case I’m showing you today was referred to me for a re-treatment, as you can observe in the picture, there was a broken file on the distal canal with a big apical periodontitis. The treatment was planned to be done in two appointments. 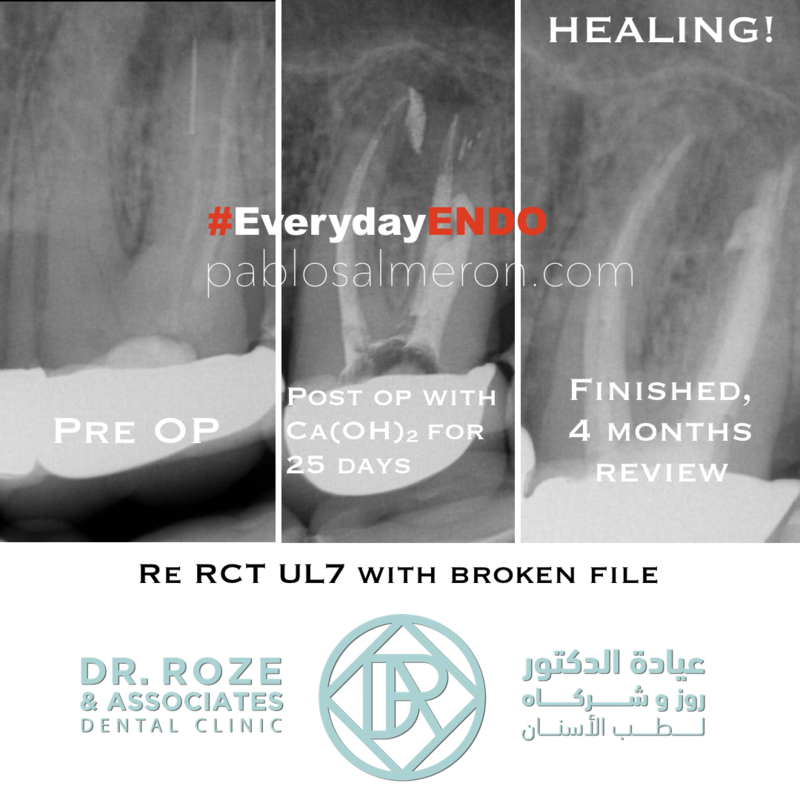 In the first one I removed the broken file, and placed calcium hydroxide for 25 days; In the second appointment the tooth was symptomless and I completed the treatment. After 4 months the patient came for a review and the PA showed new bone formation, so the infection was healing. I usually like to finish the treatments in a single appointment but is not a rule, time management has to be consider as another variable in root canals treatments and sometimes, is better to do it in two appointments and some others we need even three appointments. 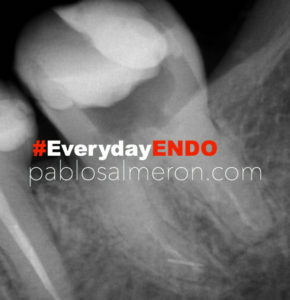 In this post I’m going to talk about how important is to work ergonomically in dentistry and endodontics. I like to think that modern dentistry is about details, patients nowadays are more conscious about the differences between good and bad jobs, Internet (Facebook, Youtube, Blogs…) has resulted in a great tool that has impacted on dentistry significally giving the oportunity to patients to check and investigate the perfomance of dentists before attending their practices. Patients not only research and compare differents jobs, they tend to discard all those professionals with no history on internet or those afraid to show their work fearing to be compare to other colleagues. Today, if you don’t show your work, you don’t exist. I don’t want to deviate my topic “4 handed dentistry” whit that short reflextion. Dentistry is about details and there is only one way where we’ll be able to work on it, we need to bring the object we are working with closer, that means MAGNIFICATION. “Traditional” magnification is to bend our back over the patient 90 degrees. Our eyes have some limitations to focus objects to a certain distance, more closer doesn’t mean that we see things bigger. So to be able to work on details we need to see things bigger, and there is only two solutions: 1) the use of loupes or, even better, 2) the surgical microscope. I’m not going to talk about the differences between loupes and microscopes because again that’s another topic, “Microscope is better of course :D”. Going back to the topic, what I want to talk about is about 4 handed dentistry which, if you are able to implement little by little training your assistant, your work will radically change, letting you be more focused and relaxed doing your job, meaning, better treatments and happy patients. So the first question we should ask ourselves is, ¿Do we need as a dentist any instrument in our side? no we don’t or at least as minimum as possible. A surgeon in an operating theatre never picks up his own instruments, the nurse do it for him, I do microsurgeries and I like to be as focused as possible on my operating field. With the next two videos I want to show you, in a very basic way, how to pass instruments with your assistant and how you can work after some training. There is more than one technique and the location of your instruments and nurse will vary depending on your surgery setup. I hope you start and benefit implementing 4 handed dentistry in your practice. Make it a point to do something every day that you don’t want to do. This is the golden rule for acquiring the habit of doing your duty without pain. In this video I want to show you how to remove a screwed post using ultrasonics. These posts has been used for a lot of years to give support to the restoration after a root canal treatment. Nowadays fiber posts which can be bonded instead of screwed, are commonly used instead of these old fashion solutions. Removing the post it’s a matter of patience, you have to break the cement around the post to make it loose. 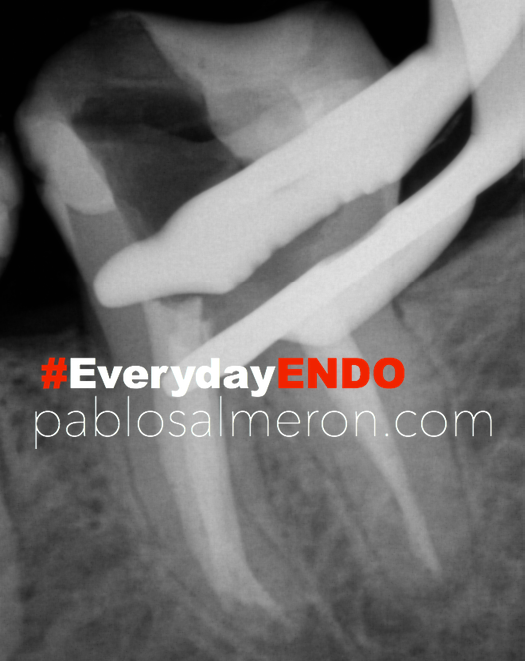 This kind of complications are just my #EverydayENDO cases. Watch the video in 720p50 HD. In this case, the doctor referring the patient asked me if I could retrieve the broken file. File retrieval is always changeling for me because usually requires a lot of time and the collaboration of the patient trying not to move due to the high magnified field of view where I work on and a lot of patience as well; the use of the proper equipment plays a very important role. This case has been done with ProUltra ultrasonic tips (Dentsply) under the Labomed Magna surgical microscope view. These tips are made of titanium and can be pre-curved allowing to work in the direction you want. The bad side of these instruments is that they tend to get blunt and break very easily. The use of the macriscope is a must, you need to see where are you activating the ultrasonic tip to preserve as much dentin as possible and to avoid perforations. The broken file it behaves as a rigid body due its short length although the alloy what is made of should let it behave as a flexible metal. As I told before, be patient and remove dentin little by little to create more space is the only way to get the file out of the canal. My advice for this kind of situations is try to bypass the broken file first, and if you can’t, try to retrieve it. Bypassing instruments is something that I’m not able to do 90% of the time. 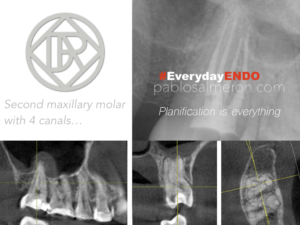 One of the most important things in Endodontics is planification, for that, we need to have an excellent knowledge of the pulp chamber anatomy as well as the different variants in configurations of the root canal system anatomy. 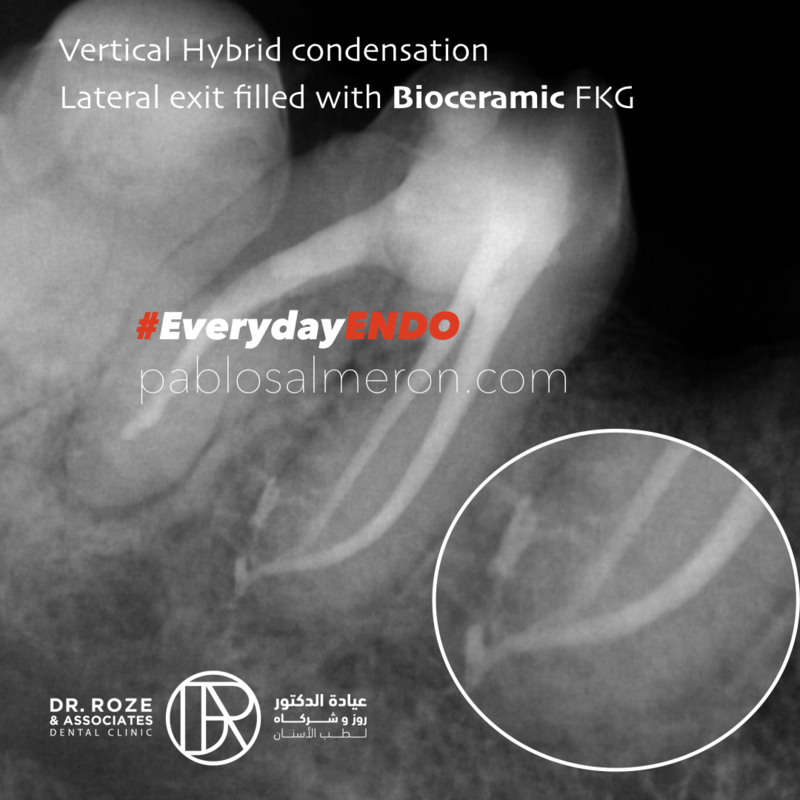 Nowadays, and according to the American Association of Endodontists, the use of the CBCT is a standard in our field. This tool, allow us to see the tooth in a 3D model, and check the anatomy from every angle. 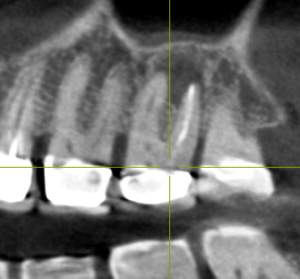 On the next case, I completed a root canal treatment in a second maxillary molar, almost the last tooth! the complexity of the case was the minimal mouth aperture of the patient and the tricky root canal anatomy with this 4 canals. Planning the cases before, allow me to do the treatments in a shorter and safer way. At Dr. Roze & Associates.